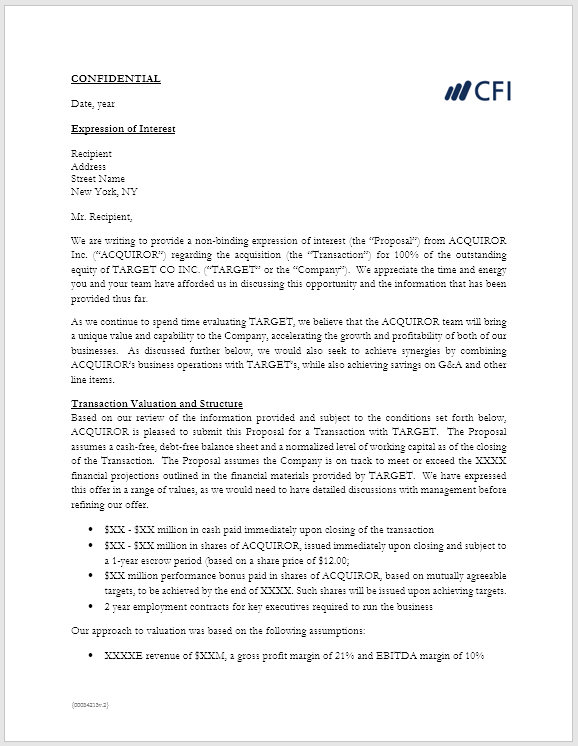 An Expression of Interest (EOI) is one of the initial transaction documentsTransactionsDownload free transaction templates including a Letter of Intent (LOI), Term Sheet, Non-Disclosure Agreement (NDA), Confidential Information Memorandum (CIM), Equity Capital Markets (ECM) memo, Due Diligence checklist, and other types of corporate transactions. Download the Word Document files for your own use shared by the buyer with the seller in a potential M&A M&A SynergiesM&A Synergies occur when the value of a merged company is higher than the sum of the two individual companies. 10 ways to estimate operational synergies in M&A deals are: 1) analyze headcount, 2) look at ways to consolidate vendors, 3) evaluate any head office or rent savings 4) estimate the value saved by sharingdeal. The EOI indicates a serious interest from the buyer that their company would be interested to pay a certain valuation and acquire the seller’s company through a formal offer. The EOI starts with some introductory praise directed towards the seller’s company. It states something like, “We are pleased to submit this indication of interest.…” It shares the buyer’s vision and strategic capabilities to take the company to greater heights. Purchase Price – An EOI covers the purchase consideration the buyer is ready to pay on a cash free and debt free basis at the time of closing the deal. It also mentions that the total consideration payable includes valuations and payments for ESOPs, bonuses, or other instruments issued by the seller regarding severance packages. The buyer also reserves the right to change the terms of the payment consideration and may choose not to proceed with the transaction, as the document is merely an expression of interest and non-binding on either party. The historical financials presented in CIM are complete and accurate. The projections by the seller show an accurate and fair picture of the business. All retirement benefits will be fully funded by the seller at the time of closing. Working Capital as of closing date should be normal and adequate to continue the business in the ordinary course. Due Diligence – As a next step, the buyer asks for an opportunity to conduct due diligence with complete satisfaction. It asks for an opportunity to conduct due diligence of both the business and the seller. It also highlights major areas that the buyer would be looking at while conducting the same. It may include diligence on Finance, Legal, Business, Customer Contracts, Vendor Contracts, Sales and Marketing, Human Resources, Facility, Technology, Plant, and Machinery, etc. Transaction Structure – The buyer explains the transaction structure they are interested in. It deals with whether they are interested in a complete buyout of the company or just a carve-out of any division. It mentions the type of assets and contracts the buyer would be interested in taking with the earn-outs structure. It also mentions how the buyer is going to fund the purchase price for the transaction, which can either be from the cash balance on their balance sheet or a bank loan. Management Retention Plan – The buyer also indicates its plans for the senior management of the seller and the type of arrangements they can deal with. Transition and Support Services – The buyer mentions that they would need transition support for a certain period of time to effectively manage the business. It also says that no additional amount shall be paid apart from the “Purchase Price” for the services. Approvals Required for the Transaction – For a deal to get the final signoff, the buyer would require approval from its Board of Directors and hence, it informs the seller about the same so that proper timelines can be decided at an early stage. Conduct of Business – The buyer expects that the seller will conduct the business in normal course without any material adverse impact on the business. In case the seller intends to engage in any kind of structural change, an intimation to the buyer should be done. Transaction Expenses – The buyer makes it very clear that any transaction expenses incurred would be met by each party on its own. Expenses can be related to due diligence, negotiation, drafting of legal agreements, professional and legal support, etc. Confidentiality – The buyer makes this proposal as an interested party to enter the transaction. It says that neither the name of the company nor the purchase consideration should be disclosed to a third party without the written consent of the buyer. The seller is supposed to disclose the identity only after definitive agreements are signed. Non-Binding Agreement – The buyer makes it explicitly clear that it is just an expression of interest between the parties and no party is bound to sign the deal. Neither buyer nor seller would be in a position to claim any kind of damage with reference to the EOI. The last paragraph of the letter includes a thanking note to the seller for their time and for taking in consideration a sale opportunity to the buyer. It also mentions the buyer’s contact details in case the seller wants to communicate with the buyer for discussion and further clarification. To learn more about mergers & acquisitions, see the following CFI resources.